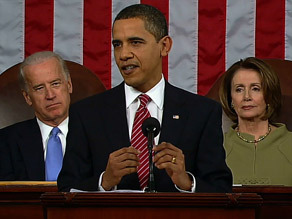 In a setting typically reserved for State of the Union addresses, President Barack Obama stood before both House and Senate members last night (Feb 24) to outline the direction he plans to take the country in the next four years as well as the steps his administration will take in the coming months to strengthen the severely bruised American economy. The 52-minute primetime speech touched on many topics. Insisting he understood the American public’s frustration with the faltering banking industry and out of control executive pay and bonuses, the President promised the era of corporate excesses for those companies that have received government bailout money are at an end. From Education to energy to healthcare, President Obama laid out a broad plan to get the American economy back on its feet and offered many details on how he plans to accomplish those goals. Read the full text of President Obama’s speech below.